The Indien-Panzer is a German tier 8 medium tank. Este proyecto se desarrolló como un carro medio para el Ejército Indio. El trabajo del proyecto fue realizado por Porsche, Daimler-Benz, y Zahnradfabrik AG de Friedrichshafen de 1954 a 1955. Sin embargo, el vehículo fue considerado demasiado complicado para su producción en la India, y el proyecto fue cancelado. Freshly purchased and stock, the Indien-Panzer mounts the extremely inadequate 88mm L/56 gun, so a fast upgrade is a must. The Indien-Panzer is not as fast as the Panther II but has superior track and turret traverse speed and, like the Panther, excels at the sniping role, taking down enemies from afar with superb accuracy. The Indien-Panzer's compact size and very small turret combined with superb gun elevation angles give it many advantages when hull-down. Furthermore, its thin yet extremely sloped frontal armor can be surprisingly bouncy. 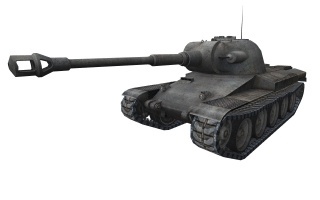 However, although effectively better than the Panther II's, its 90mm-thick armor is nothing to boast about. Major setbacks may include the long aiming time, sluggish acceleration, and the paper-thin gun mantlet. The Indien-Panzer leads to the Leopard Prototyp A. The Indien-Panzer is very similar, yet quite different from the alternate tier 8 German medium tank, the Panther II. Unlike the Indien-Panzer, the Panther II offers an alternative rapid-firing 7,5 cm gun, although this weapon is quite weak and has much lower DPM. The Indien-Panzer however, in return offers a 9 cm gun, which can be researched after researching the 8,8 cm KwK 43 L/71 gun shared by both vehicles (which has identical stats on both the Panther and Indien). This slightly-improved 9 cm gun increases the Indien-Panzer's DPM by roughly 200 damage, nothing to get excited about. The Indien-Panzer has a weaker engine and lower top speed than the Panther II, which makes it far from stellar at acceleration. 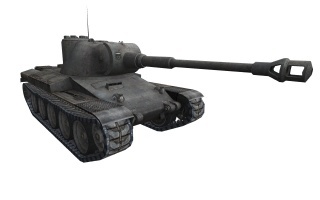 However, the Indien has a higher turret and track traverse speed, which makes it handle much better than the Panther. In comparison to the other tier 8 medium tanks, the Indien-Panzer boasts a decent penetration AP round at 212 pen. Its engine has a very low chance of catching on fire, which is further safeguarded by the rear-mounted transmission, a common problem in German vehicles. The alpha damage isn't very high, but is relatively good in comparison to competing mediums. Probably the most distinguishing advantage of the Indien-Panzer is its excellent gun depression coupled with a very small and difficult-to-hit turret and high damage per minute. Unfortunately, the turret won't hold up if it does get hit. Finding and getting used to the Indien's play style will prepare its driver for the next tanks in the line, the Leopards, which are very similar in being very flexible, maneuverable, potent snipers, and capable jack-of-all-trades. As for the play-style itself, it can be best described as a highly mobile turreted tank destroyer, a pure support medium. Stay back in the second line, use your gun depression to expose as little as possible, hide behind bushes to aim in, keep the gun firing from stationary positions, and when needed, you can spot some targets and move to another fixed position and keep up a steady stream of effective support fire. With your high DPM and reliable mix of penetration and accuracy, you can bleed down enemies from afar. If you need to shoot on the move, it's important to practice "bloom control": minimize turning of both the hull and turret so that when you let the shot fly, you're effectively partially aimed in to begin with. This is, in common with the AMX 50 100, a very important skill to learn, as firing while on the move with both the hull and turret traversing in either is almost a guaranteed miss, even at point-blank ranges. The stock gun is thoroughly inadequate, and the upgrade should be researched early. Unfortunately, you can't mount the second gun or any equipment before upgrading the tracks or adding Enhanced Leaf Springs class 2. However, for another 4300 Xp you can get the 9 cm gun which is lighter and thus will allow you to use both the gun and equipment without having to get the upgraded tracks. 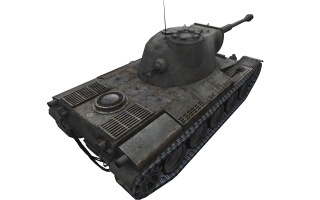 The top engine and top radio are unlocked when you research Leopard PT A, but consider at least researching the updated engine beforehand to improve your mobility. In the immediate post war climate in West Germany, German weapons manufacturers were not involved in development and production of armored vehicles. However, that did not stop manufacturers like Porsche to try to sell its designs to foreign nation. In the period from 1954-55 joint venture formed from Porsche (overall design), Daimler-Benz (MB837A 8-cyl diesel engine), Zahnradfabrik AG of Friedrichshafen (tracks & parts of transmission), Ruhrstahl (turret & gun) and TATA (manufacturing in India plus sights & optics) offered their design to the Indian government. Intended to meet an Indian need for a 36-39 ton tank, the German submission would probably have been around 40 tons. Engine with the power of 670 HP would gave power to weight of around 16,7 hp/t and a top speed of around 50 km/h. 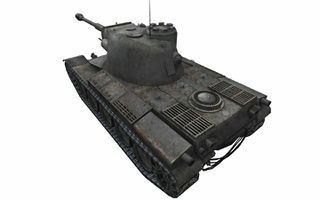 Main armament consisted of 90 mm gun with The rifled barrel, while max armor thickness was 90 mm on the hull front and 130 mm on the turret front. 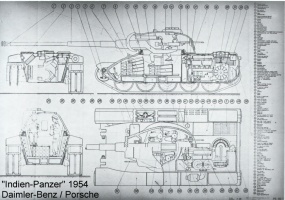 The Indian panzer competed with the British design, which the Indians eventually choose. Interestingly the Vickers tank was built entirely from welded rolled steel plates. According to some sources this feature was seen as an advantage by the Indian army, who wanted the tank to be license built in the country. Cast armor requires special foundry facilities, which were not available in India at the time the Vickers tank was developed. The Porsche design, on the contrary, had cast turret and much of the hull, so to build it in India might have been considered not impossible but surely quite difficult and expensive. The project was rejected in the drawing phase, and no prototypes were ever built. The Indians eventually went for the Vickers MBT whose prototype was completed in 1963 and the tank entered service in 1965. The first 90 vehicles were built by Vickers in the UK, while production continued at the Heavy Vehicles Factory in Avadi. A total of 2,200 units under the name Vijayanta were built until 1983 when the production was stopped.